Updated: Women's March founder Teresa Shook called on March leaders to step down Monday, saying they "steered the Movement away from its true course. I have waited, hoping they would right the ship. But they have not." Read her full statement here. "We may not agree on everything," Ben & Jerry's Twitter feed responded to an immediate wave of criticism following the announcement, "but the work that Linda has done to promote women's rights is undeniably important and we are proud to join her in that effort." 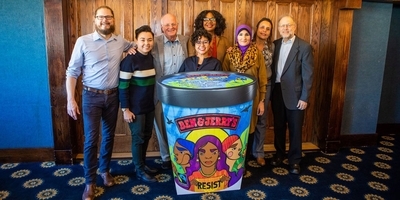 In a separate statement defending their partnership, Ben & Jerry's claimed the Women's March has been "unequivocal in denouncing religious discrimination, and anti-Semitism specifically." It pointed to a Women's March statement in which it claims to seek a world "free from anti-Semitism, homophobia, transphobia, sexism, racism, and all forms of social violence." That fits Sarsour as long as you pay no attention to everything she has done and said. For years. She opposes the state of Israel's very existence – a viewpoint that by itself meets the State Department definition of anti-Semitism. And, in a recording obtained by the Investigative Project on Terrorism, Sarsour blamed Jews for police shootings of unarmed black people in America. She considers ultra-conservative Muslim clerics – those who advocate for strict, Saudi-styled restrictions on women and who are virulently anti-gay – as her heroes and mentors. And she embraced an actual Palestinian terrorist in Rasmieh Odeh, responsible for a 1969 Jerusalem grocery store bombing that killed two college students. That's just part of a record Ben & Jerry's dismisses under the context of "We may not agree on everything." Sarsour and national March President Tamika Mallory have struggled clumsily with Louis Farrakhan's bigotry. Farrakhan is stridently anti-LGBT and proudly anti-Semitic. Mallory is a long-time admirer, calling the Nation of Islam leader the "GOAT" (greatest of all time) and Sarsour rushed to Mallory's defense when Mallory refused to condemn Farrakhan's bigoted rhetoric. None of that stopped Ben & Jerry's from choosing to elevate the Women's March. The partnership also fell victim to some poor timing. In the week following Pecan Resist's release, two major liberal celebrities broke with the Women's March, and a German political group withdrew a human rights award it had planned to bestow upon March leaders. 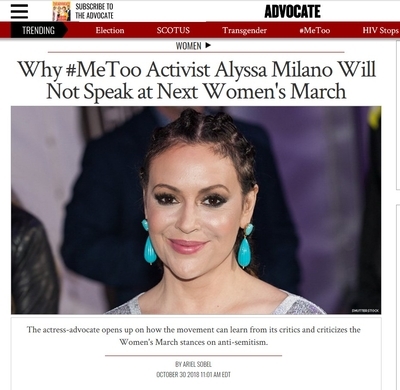 "Any time that there is any bigotry or anti-Semitism in that respect, it needs to be called out and addressed," TV star Alyssa Milano told the Advocate, explaining why she is unlikely participate in a future Women's March until it has new leadership. "I'm disappointed in the leadership of the Women's March that they haven't done it adequately." Debra Messing, longtime star of Will & Grace, then publicly supported Milano. On Wednesday, the "Womxn's March Denver" issued a statement denouncing "anti-Semitism and the National Women's March leadership team's failure to clearly disassociate from anti-Semitic public figures." The movement seems to be going against Women's March leaders, and hopefully, against the poisonous ideas they embrace. It was the Friedrich-Ebert-Stiftung Foundation for Social Democracy that laid out the details showing the disqualifying record of Women's March leaders, again, especially Sarsour. In an open letter Nov. 6 urging the foundation withdraw a human rights award scheduled to be bestowed upon Women's March leaders, foundation "scholarship holders and alumni" made the case that "Women's March USA does not constitute an inclusive alliance" because organizers trivialize anti-Semitism and exclude Zionists. Sarsour's comments blaming Jews for police shootings of unarmed black people was among the examples, including language directly from the IPT's original exclusive report. It also showed how March President Tamika Mallory has stood by Nation of Islam leader Louis Farrakhan despite his repeated anti-Semitic slurs calling Jews "bloodsuckers" and "termites." Sarsour's own comments the past three months alone make the assertion laughable. Let's go back to what she said about police shootings during a speech at the Islamic Society of North America (ISNA) convention Labor Day weekend. Sarsour was justifying her criticism of the Anti-Defamation League (ADL), a 105-year-old Jewish organization devoted to fighting anti-Semitism and other forms of hate. The ADL also sponsors a National Counter-Terrorism Seminar in Israel, giving American police department leaders a chance to learn counter-terrorism strategies from Israeli officials with more experience. To Sarsour, this is sinister. The ADL, she said, "takes police officers from America, funds their trips, takes them to Israel so they can be trained by the Israeli police and military, and then they come back here and do what? Stop and frisk, killing unarmed black people across the country." There is zero evidence linking any police shooting to the training seminar, run by and funded by Jews. Her open letter makes no mention of these comments. Neither do they address a Facebook post she made Thursday evening, which again made her hatred of Jews clear. She urged followers to sign a petition defending incoming U.S. Rep. Ilhan Omar, D-Minn. During her primary campaign, Omar told voters she supported a two-state solution to the Israeli-Palestinian conflict and didn't think BDS helped move in that direction. Now that she's been elected, Omar flipped and publicly stated her support for BDS. To Sarsour, any critics upset that a politician– on the right or the left – misled them on a significant issue are people who "always choose their allegiance to Israel over their commitment to democracy and free speech." This kind of dual-loyalty accusation is another anti-Semitic trope used to attack Jews throughout history and it's consistent with Sarsour's bigotry detailed in the Friedrich Ebert Foundation letter. "An organization that may support feminism, but discriminates against Jews* and Zionists* and denies Israel's right to exist should not be honored by a democratic foundation that advocates diversity and speaks out against discrimination," the foundation letter concludes. Canadian Prime Minister Justin Trudeau wasn't talking about Sarsour or the Women's March in a speech Nov. 7 apologizing for Canada's 1939 refusal to admit a ship of German Jewish refugees, but he did highlight two relevant and compelling examples of anti-Semitism embraced by liberals today. "Jewish students still feel unwelcome and uncomfortable on some of our college and university campuses because of BDS-related intimidation," he said. "And out of our entire community of nations, it is Israel whose right to exist is most widely – and wrongly – questioned." Sarsour supports both behaviors. She calls herself "an unapologetic pro-BDS, one-state solution" supporter. BDS singles out the world's only Jewish state for an economic, political and intellectual boycott. And a one-state solution as Sarsour envisions would eliminate Israel's Jewish majority, ending the country's status as a refuge for Jews from global anti-Semitism. Ben & Jerry's clearly believes that Sarsour and the Women's March still merit support, and that's its founders' right. But it's fair to suggest that they find other women's movements to support that don't have the Women's March's baggage and questionable views toward minority groups facing increased bigotry and isolation. When was the election in which the hundreds of thousands of women said that the current leadership is the best, and only, one capable of organizing and leading? There are endless feminist leaders out there who can run the Women's March, advocating for the same causes and opposing the current administration with equal or greater passion, but whose leaders don't find Zionists "creepy" or otherwise unworthy of partnerships. Women who can muster the temerity to say Louis Farrakhan's clear and repeated views toward Jews, gays and lesbians and others is unacceptable in a liberal, feminist movement. Yet the current leaders refuse to put the good of their movement ahead of advancing their own profiles. If Ben and Jerry want to support the Women's March, they might join voices like Alyssa Milano, Debra Messing, the Women's March Alliance, Women For All, Zionness, and many others. Louis Farrakhan has defenders who stand by him despite his bigotry. He and the Nation of Islam have done a lot of good things for poor black people, they say. It's a form of situational ethics that would not be applied to hatemongers elsewhere on the political spectrum. It is sad to see Ben & Jerry's employ the same kind of rationalizing with the Women's March.